Below is the entire AFT donor list from when it was first created in June to the latest campaign filing through Aug. 10 (on the Hillsborough County Supervisor of Elections website). A total of 15 donations were made to what AFT called a “community”-led tax hike petition effort. In a county where 1.4 million reside, it was actually a microscopic “community” of five donors who paid consultants and petition gatherers to get the transit tax hike on the ballot. A dismal $700.72 came from 10 other donors, a whopping 15 donors in all. AFT’s “community”-led transit tax-hike effort ignored or disregarded the largest employer community in the county -- the Hillsborough County School District -- which had been considering a sales tax increase to fund education. AFT was able to pre-empt the school district’s request for their OPPAGA audit -- as we reported here. 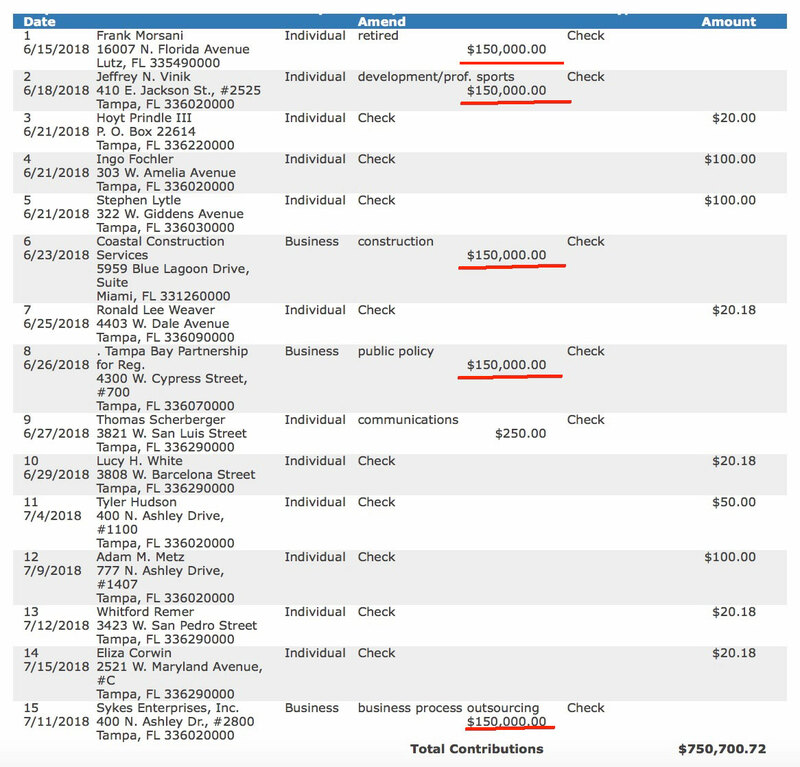 The five downtown Tampa special interests formed the bank account for AFT. Without the $750,000 from them, the All for Transportation tax hike would not exist. Because from AFT’s latest campaign filings through Aug. 10 on the SOE website, $677,400 of the special interest funding was spent getting the transit tax hike on the November ballot. For "AFT Donors and Expenditures," see the chart below. Over 92 percent ($625,000) was spent on paid petition gatherers, many of whom did not even live in Hillsborough County. Yes, AFT hired non-Hillsborough residents to convince county voters to raise their taxes for development interests. Mercury was one of the PR firms that wanted to promote the ill-fated Go Hillsborough advocacy campaign. The Times reported in 2016 that it was Mercury that conducted the poll “financed by unidentified business interests” on the Go Hillsborough one-half percent tax hike. “The Times has taken itself out of being fair and balanced when writing about Vinik, his companies and the deals government is making with him,” Manteiga writes. With the same special interests that bought their way onto the ballot also bailing out the Times, they now have a personal media megaphone to cheerlead for the transit tax hike and filter out, shut down, and ignore any opposition. 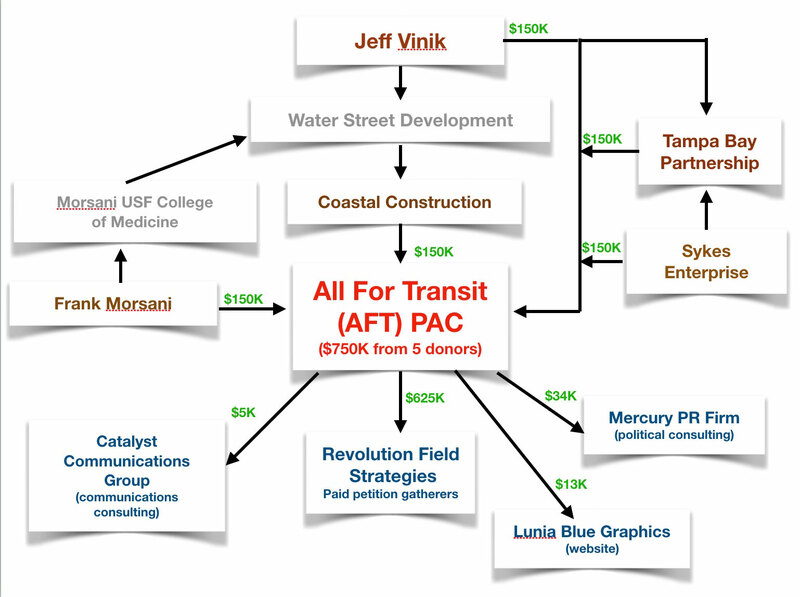 AFT also has a nonprofit, Keep Hillsborough Moving, that is the PAC’s connected organization. Nonprofit donors and expenditures are hidden from the public so the nonprofit will also have donors and expenditures outside all transparency. The public will never know the identity of the nonprofit’s donors; however, political advocacy campaigns cannot be legally run through a nonprofit. With only $73,000 remaining, AFT’s coffers must be replenished very soon to launch an aggressive marketing and deceptive advocacy campaign over the next 75 days. Expectations are that multi-millions will be spent. I’m not interested in voting for a tax to bail out Vinik. Thanks, no thanks. The insanity of this plan to get voters to slit their own throats is the same freaking plan Ken Hagan had 3 years ago. Now they have a complicit media peddling the “penny tax” when it’s actually one percent. LIARS. All of them. Morsani special interest because he gave money to a medical school? It's hard to take this piece seriously when you resort to that. It is because the medical school is one of the few building blocks of Vinik’s failing development. Try to keep up, John. Way to connect the dots, except these are not dots, they are boulders. You'll be sorry for a long, long time TAMPA,... IF you let THIS one through...! Now that is what I would call excellent journalism, we need more like her. Good job, Sharon. It looks like AFT gets the big money... and the voters get the shAFT. As always, excellent research and reporting from Sharon Calvert! Just vote NO on this rail for the stadium at our expense.